Leading Manufacturer of automatic bundling machine from Baddi. We have been engrossed in providing a huge spectrum of Automatic Bundling Machine. 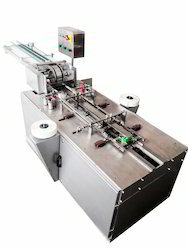 Designed with digital timer and controller, the offered machine is mainly used for bundling and packaging of soap bars. The provided machine is precisely manufactured at our highly advanced production set up by proficient professionals using top-grade components. The offered Automatic Bundling Machine can be purchased in varied specifications from us. Looking for Automatic Bundling Machine ?